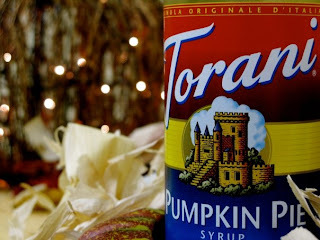 Being Frugal and Making It Work: Torani Flavored Syrup for Mochas, Hot Chocolate & More! Torani Flavored Syrup for Mochas, Hot Chocolate & More! With the cold winter weather upon us, hot chocolate is a staple in our house, for both myself and my children. As much as we love plain hot chocolate, there are a few things that make it extra special. Those things include marshmallows and peppermint! Peppermint mochas are a favorite of mine and peppermint hot chocolate is a favorite of both my children, especially when you top it with whip creme! With the great Holiday flavors of Torani in your home, every drink you make can be inspired. Discover how their syrups can help you make truly creative flavored coffees, lattes, mochas, cocktails, and more. Torani's holiday flavors include Pumpkin Pie, Gingerbread and Peppermint and they offer a variety of recipes to help you play and explore. I love adding Torani flavored syrup and milk to my coffee, no sugar needed! My kids love it when I add a shot of Torani into their cold milk or when I warm the milk and create a delicious, flavored steamer! My children love it just as much as I do, it's one of their special treats! With over 100 flavors to choose from including sugar free flavors, you will find the perfect taste for any drink! Flavors from vanilla and maple to blueberry and white chocolate. There is even a bacon flavored syrup, YEP... BACON! The best thing about Torani is that it tastes great and can be added to all of your favorite drinks! Satisfy your taste for inspiration - explore, create and delight your senses with their flavors. The possibilities are endless. Use the search feature to find the perfect recipe to meet your needs - search by category, recipe, Torani flavor or taste rating.